You Were Born To Run, So Get At It! We can't really answer these without diving into the topic in more detail, so let's lay down some background information, and along the way I'll tell you a bit about my own experience. Your dog can probably leave you in its dust. If a bear tries to chase you down, pray there's a nearby tree to climb, because you're certainly not going to outpace it on foot. There are even several varieties of snake we can just barely outrun, and they don't have legs. When even the fastest runners our species can muster move like sloths compared to a "real" running animal like the cheetah, it's easy to see we just weren't made for fast movement. All the same, we were born to run. Humans lost out when it came to speed, but we traded it for unbeatable endurance. Every year, more than a million humans run in over 800 marathons on this planet; nothing is chasing them. Are they some mad subset of our race, or merely a group that remembers something the rest of us have forgotten? For reasons inexplicable and scientific, these runners find it enjoyable, or at least advisable, to haul their bodies across 26.2-mile courses when they could just as easily be seated in front of their televisions. Others come through ultramarathon runs of 1,000 miles or more unfazed and ready for more. How many cheetahs have you seen running for more than a few minutes at a time? Probably none, because a cheetah would have collapsed long before it completed a marathon. Even the best distance runners in the animal kingdom, such as horses and dogs, will only run so far if forced. But day after day, humans hit the streets, blissfully running mile after mile at the risk of serious injuries that don't seem to afflict animals. A horse can hold a galloping speed of 7.7 meters a second for around 10 minutes before having to slow to 5.8 meters a second. A trained marathoner can cover 6 meters a second for hours, which means that, odd as it seems, humans periodically beat horses in races. Over longer distances, humans can run horses into the ground. But how how do we reconcile our stamina with the inescapable dead end of our injury ratio? In 2008, as I powered through the finish line of the New Haven Road Race, I tried my best to ignore the persistent throb sounding painfully through cartilage in both feet my feet. All I knew was that at that moment, I wasn't born to run farther than the nearby grassy patch so could collapse. I didn't know it then, but after months of training, my plan to run the Hartford Marathon that October had just come to an abrupt end. The best running advice I'd gotten, and all the subsequent help I received from a sports physical therapist, wasn't enough to overcome the fact that I screwed up. I wasn't really one to pay attention to injuries, so at the slightest sign of abatement I started to run again, and my right foot paid the price. A ball of pain enveloped the entire top half of my right foot on a short run near my apartment one morning before work, and I hobbled around the entire winter. So was I just not born to run? I had flat, broad, pronating feet, after all, but I'd discovered that running can be intoxicating, and I had no interest in giving up my hobby. People kept telling me what I really needed was a good pair of orthodics if I ever wanted to make another go at a marathon, but even then I knew that mother culture was feeding me a bunch of crap. It's just that I wasn't sure what part was the crap back then, and I had nothing to slot into its place. If I chose to believe my feet weren't made for running, and that they were in fact defective, then the whole health framework I'd developed over the preceding decade would have to be scrapped. I'd already realized I was not, in fact, trapped in an overweight body by unshakable genetics, and I'd proven it to myself by losing 55 pounds. I'd realized that there was more to colitis than what the doctors were telling me, and I proved it to myself by curing myself through a raw vegan diet. Likewise, headaches and backaches had disappeared when I found the right key. So was I to just throw in the towel in deference to supposedly defective feet? Over the last decade I've developed something of a stubborn streak, and I realized if I didn't want to surrender, I had a lot of research ahead of me. There was just something so viscerably primal about running that I couldn't give it up. I've run when I'm scared, I've run when I'm estatic, and I've run off anger. It's always worth it, becuase I was born to run. Our reputations as brainy weaklings that would be toast without our technology is exaggerated at best. We need only look at our marvellous feet and our other adaptations to understand that we have been well equipped to do what we need to survive. Twenty six bones, 33 joints, 107 ligaments, 19 muscles. The foot is a masterpiece that's been admired by engineers and artists for centuries. Its crux is the arch, a brilliant invention mother nature beat us to by millions of years. The beauty of an arch is that it only gets stronger under stress. Smash down hard on it and and it's more sound than it was before. Run 100 miles on it and its just as good as ever. The arches of your feet are supported by an interconnected, high tension web of bones -a quarter of our bones are in our feet- joints, elastic tendons and muscles, which act as a kind of stabilizing buttress for the arch. A human foot is very easily distinguished from that of our walking relatives, the chimps. Our feet are arched, theirs are flat. Our toes are straight and short for running, while theirs are splay out and longer, which is ideal for steady walking. We've got a ton of tendons, and they have only a few. What is running? Its essentially just a kind of a repetitive hop, which is ideal for all the tendons we have. Tendons are basically rubber bands. The more you stretch a tendon, the bigger the burst of energy you get when the leg swings back. They work a bit like springs, providing stability with no active work. This also allows tendons to store and recover energy at high efficiency. During a human stride, the achilles tendons stretch as the ankle joint dorsiflexes. As the foot points toward the ground for a landing, the stored elastic energy is released. Achilles tendons, the constantly-injured banes of many runners, are actually one of our greatest running asset. You won't find them on walking animals like chimps, but only on elite runners like humans, which were born to run. It struck me as pathetic one cold day in October, as frost started to line the windows of my apartment, that I'd broken myself in $120 running shoes while there were half-naked tribesman running epic distances in moccasins, sandals, or nothing but their skin. 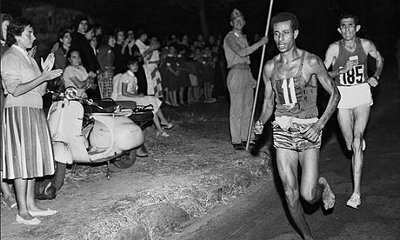 I'd seen pictures of Zola Budd, Tegla Loroupe, Bruce Tulloh and Abebe Bikila, who all racked up multiple medals and records with nothing on their feet. I found a magazine article about the peaceful tarahumara runners -whose name for themselves, Raramuri, means "runners on foot,"-, who fly gracefully over their mountainous crags in nothing but jury-rigged sandals. 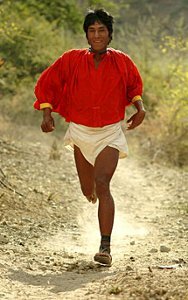 Pictures of the tarahumara on their ultramarathon treks made me smile. 'Now there are some working feet', I thought. Yet when I brought the idea of barefoot running up with my physical therapist, it earned me a raised eyebrow. 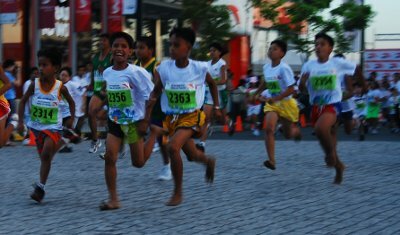 Yeah, they run barefoot, he said, but they have good feet with arches and have been running barefoot all their lives. Your feet are like pancakes and you've always worn shoes, so what you need is orthodics. His advice was sound as far as the conventional running went, if you can call anything as dysfunctional as our running industry conventional. The same thinking that brought about his response was also responsible for the generally-accepted ideas about footstriking and shoes that had injured me in the first place, so I couldn't make myself swallow it. I kept putting off those orthodics-sizing sessions he recommended. As he ran some sort of high-frequency machine around my foot, I couldn't help staring at my my flat arch, thinking about what it would be like to run down a street with nothing between my skin and the pavement. The idea was lodged in my head. But the likes of Zola Budd were long gone from the Olympic world, and the running tribes like the tarahumara were vanishing as our civilization coopted or destroyed them. Where was I to learn how to run barefoot? Humans are the only mammals that can release most of their heat by sweating, which doesn't seem like much of an advantage, at first. But most mammals cool off by panting, even if they have sweat glands. When they build up more heat than they can let out during exhalation, they must stop and cool off or die. Humans can keep going as long they can keep sweating, so it becomes more a matter of proper hydration and fuel rather than one of cooling. This has quite a few implications for running. As other animals slink off to the shade to rest, we can keep going in the midday sun. In our early days, this was a massive operational advantage. Many running animals use a tail for a counterbalance, but all we have is a rather large buttocks. Our sizeable gluteus maximus has the massive job of keeping our trunk upright, especially when running. Our non-running chimp relatives have buttocks that are notably less pronounced. Also, Our Nuchal ligament, a tendon that stabilizes the head, isn't present in walkers like the chimps, but can be found in runners like humans and horses. The winter wasn't easy. It still hurt to walk, but I oddly observed that the boots I was using to traipse my way down the snowy sidewalks to work were killing me, while the old battered brown shoes I put on when I arrived didn't cause me nearly so much trouble. I knew that I was in no condition to be running, but as the winter wore on and I continued to heal, I found myself standing on the indoor track of my local YMCA one morning, a pair of glove-like contraptions on my feet. I'd stumbled onto a post about Vibram's Five Fingers on a forum somewhere, and quickly ordered a pair of the quirky-looking things. I knew that my skin was not the thickly-calloused stuff of an advanced barefoot runner, but that I might get a feel for things with a bit of protection between me and the floor. Besides, they're strictly anti barefoot at the Y, so I needed something. It was the first time I'd ever attempted to run without supposedly-stabilizing anti-pronation shoes, and I experimentally toed the ground and rolled my feet around on the track to see how it felt. I'd spent the previous few days watching all the videos I could find of western barefoot runners and tribespeople who run with little or nothing on their feet. There were a few key differences I observed between their running and my own. The main point I took from the videos was that none of the barefoot runners landed on their heels, because, as I found out through experimentation, it hurts way too much. Runners proudly boast of increasing the length of their stride, which usually means reaching the leg far out in front of them and landing on their heel. Kick off your shoes and try doing this barefoot and you'll findit's next to impossible to maintain for more than a few steps on a hard surface. There's no way that a heel strike could have been the natural inclination of our running ancestors. Instead of landing on the heel, the runners I was observing in the videos landed flat footed or on the forefoot. Another thing that I noticed was that their strides were short but very rapid, and their heels kicked up into the air behind them. They could still run fast this way, but with considerably less jaring. I saw most barefoot runners have excellent posture. Running on the street, I often see joggers bent at the waist. Barefoot runners pretty much keep their torsos and heads in a straight line. Some do bend, but they do so at the ankles, a la ski jumpers. Later on I noticed most of the children sprinting around the playground in a park I run through display the same style, though they apparently seem to lose their inclination for it at some point. And so at the Y I started teaching myself to run in place while mimicing that style. Eventually, when my right foot allowed it, I started doing a few laps. My conclusion? It felt good. In fact, running had never felt better. Slowly, I started to imagine that I might have been wrong. Maybe, despite my flat feet and pronation, I really might have been born to run. Born To Run: Could We Be Endurance Hunters? So why were we born to run? What possible practical purpose could long-distance running be put to? It's a question that no one has a solid answer to, but we're starting to make progress. A number of scientists, taking note of our unusual running ability, theorize that the it evolved so we could exploit an empty hunting niche. They note that extant aboriginal peoples will occasionally literally run prey to death over many miles because their cooling abilities can't keep up with ours. Yet even among Aboriginals, this is a source of a relatively small portion of their calories. I'd argue that given how the rest of the human body is laid out, we adapted the ability to travel over the emerging African savanna to the fruit trees we rely on. This is too complex of a topic to adequately tackle here, so if you'd like more information about this, check out this article on human evolution. If We Were Born To Run, Why Are We Constantly Injured Doing It? Why we were born to run may be up for interpretation to run, but it's clear that in recent decades, we've fallen far from our potential. Messed up hamstrings, knee pain, plantar fasciitis, tendinitis - runners are a mess. The culprit are the clunky running shoes and other corrective devices that steal our strength, allow us to adopt unnatural running strides. To read about recent surge of research that is showing running shoes to be injury causers, and learn more about what you can do to stop the idiocy, read this article. As the last of winter snow began melting, I found myself padding down my city's streets in five fingers. At first it was tough to run just two miles, but I took things really slow. The calf muscles, ankles, and stabilizers I'd never fully used in in running shoes were sore after just a short run, but I just gave myself more time to adjust because I realized I was really onto something. Though my right foot occasionally voiced some complaint, I found that as long as I stayed out of heeled shoes I could run without reinjuring it. I read somewhere that most running shoes are similar to the casts we put our broken limbs in. Sure, they'll lock it in place and keep it stable, but so too will it mean the atrophy of all the muscles in the area. When you free your feet again, you'd better be ready for some major muscle building. In May I decided to enter the Bishop's 5k For Kids, which was the second race I'd ever competed in. I had no intention of trying very hard, but I found myself easily outpacing most of the runners, and even took first in my 19-29 age group. I shouldn't have, but some runners in front of me accidentally left the boundaries of the race and were disqualified. But still, I did better than I ever expected to do barefoot, and proved the viability of the idea. . Since then I've been running completely barefoot on grass, trails, and pavement in an attempt to build up the tolerance of my skin. I ran the 2009 Hartford Marathon in Five Fingers, and was amazed at how well it went. I plan to continue to increase my barefoot and minimalist speed and endurance. The best part is that I feel I'm only just approaching my potential, and that I could conceivably build up to ultramarathon distances over the course of a few years if I feel the urge. You were born to run, and you have no more need of being injured than you do of being sick. If you're feeling lethargic and find it hard to breath when you're running, it's likely that you're out of shape, but you could also be suffering from poor health in general. Chronic fatigue is a growing problem in our over stimulated world, and the only answer is healthy living. Just breathing is another problem. I could never breathe through my nose when running until I'd stopped eating meat, dairy, eggs and grains. Similar changes will set you on the right path. Barefoot or minimalist running is not magic, but merely common sense. When you remove the shoes that allow you to adopt a running style in which you can injure yourself, you have little choice but to run in a more natural manner, even if you're not perfect. Transitioning to barefoot running is an article in its own right, but it's safe to say you should go slow. Though I had been running 6 years when I went barefoot, and I was also a yoga devotee with legs in good shape, I still had major soreness, and I've spoken to others that had a much harder transition than myself. Go too quick and you risk serious injury, so just take things easy. I think you'll find, after padding around a bit with so little between the earth and your feet, that you absolutely love it, and you'll have to admit that you are indeed born to run. And besides, it's not just a joy, but a joy that's good for you. You were born to run, so get at it. "Humans really are obligatorily required to do aerobic exercise in order to stay healthy, and I think that has deep roots in our evolutionary history. If there' s a magic bullet to make human beings healthy, it is to run." -Harvard Anthropology Professor Dr. Daniel Lieberman. Read about barefoot running here. Want to start running in minimalist footwear or barefoot? Read about how to transition without hurting yourself. Learn why we may have been born to run in his article on evolution. Consider the battery of science showing why barefoot running is best. Check out my review of the Vibram Five Fingers. A review of my favorite running footwear, the Luna Sandals Leadville Pacers. Learn how to make a healthy sports drink for long-distance runs.